Moving object detection, frontDetects moving objects near front of vehicle when driving at parking lot speeds. Detects moving objects near front of vehicle when driving at parking lot speeds. Moving object detection, rearDetects moving objects near rear of vehicle when driving at parking lot speeds. Detects moving objects near rear of vehicle when driving at parking lot speeds. Predictive forward collision warningAlerts driver when traffic behavior up to two cars ahead makes a collision likely. Alerts driver when traffic behavior up to two cars ahead makes a collision likely. Active steering, electronic linkNo mechanical linkage between the steering wheel and the front wheels in normal operation, but with a mechanical backup. Different modes alter steering quickness and weight. No mechanical linkage between the steering wheel and the front wheels in normal operation, but with a mechanical backup. Different modes alter steering quickness and weight. 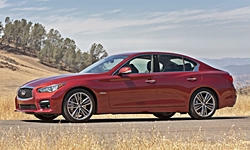 None of our members have yet commented on the available features of the 2014 Infiniti .